It can be a hassle trying to find a cooler that can handle the toughest of environments, especially if you enjoy spending your time in the outdoors. No matter how small the ice chest is or how simple it is to use, the weather or surroundings that you enter on the day you plan to use it can cause problems without the proper design. In comes ICEHOLE, a brand that is able to fulfill the “100% American Made” claim that many companies promise to live up to thanks to 35 years of working with the U.S. military. Different sizes are available to suit different predicaments, whether you just want to bring some drinks to your friend’s house for a party or plan on carrying some game from your fishing trip in the mountains. The construction ensures that whatever you’re carrying will stay safe and snug, no matter what the weather is like or what animal shows up at your campsite. Learn everything you need to know for your next outdoor trip with this ICEHOLE Cooler review. The involvement of the U.S. military has guaranteed that nature won’t ruin your fun time when it comes to ICEHOLE’s offerings. Here are a few examples for how. A major concern of cooler owners is whether or not theirs will be able to handle bad weather or landing on gravel and harsher surfaces in case you and/or your friend have a tough time carrying it. 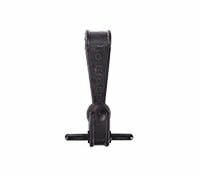 You won’t have to worry about that with ICEHOLE’s options, which come with a roto-molded, one-piece construction that is thick and rugged, emphasizing that it is made completely in America. Their toughness earned them the nickname the “Patton” based on the name given to the M60 main battle tank that was used during World War II. A major praise that ICEHOLE has been receiving from critics is that this brand even has what it takes to keep bears, cougars and other large animals sneaking around the campsite from trying to get inside and steal your food and drinks while you’re offsite. The feet of the cooler also guarantee stabilization with the intent of avoiding any skidding or marking. Not only will you not have to worry about your ice chest falling or getting knocked over, but you won’t have to try to remove marks from it when you get home. 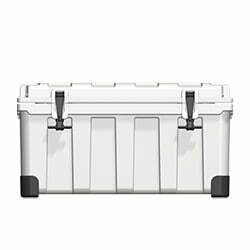 One of the worries that we have while carrying coolers is that the latch will open and spill everything that you cooked and bought from the store. 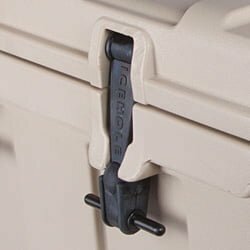 However, ICEHOLE’s Bradley APC latches are designed to keep everything locked in and assure that you’ll be able to satisfy the rest of your party. This is accomplished by giving the ice chest the same design as the M2 Bradley fighting vehicle. It’s tough to serve nice, cold beers and sodas to your friends by the river when your cooler ends up leaking and gets rid of the main source that keeps your items in prime condition. You can avoid this with ICEHOLE’s plugs, which have heads made of rubber to make sure that it has a secure grip when you’re holding it. That way, the only time water leaves your cooler is when you unplug it back at home to get rid of the melted ice. You’ll also be satisfied with the cooler’s custom one-piece gasket, which is vulcanized into a continuous loop to make it easy to use. Another factor that you’ll need to worry about with owning a cooler in order to keep your items cold is making sure that it has the right amount of insulation. ICEHOLE deals with this with its two inches of pressure-injected polyurethane foam, which guarantees that whatever drinks or food you’re keeping inside will be fresh when you take them out. While most coolers aren’t designed to keep items cold for any longer than a weekend, that is not the case with ICEHOLE. Customers have been raving about how long its coolers are able to keep items fresh, even up to 10 days, making it perfect for a week away from the house as well as a weekend party. If you have a tone of fish to carry with you after a long afternoon out on the river, or you have a load of drinks to bring to a friend’s birthday party or a big celebration with a family member, you’re going to need a large amount of ice to ensure that you have drinks and food to provide everyone. You won’t have to worry about that with ICEHOLE, as all of its options, including the Epic 35, Epic 60 and Epic 1, can hold up to 28 pounds of ice and 20 cans of beer. Despite the difference in size between these offerings, all of them are able to ensure that no one will go hungry or thirsty by the end of the night. ICEHOLE doesn’t stop at emphasizing “American Made” with its coolers with the design, as its options’ sizes are aimed at containing food and drinks that can satisfy a large crowd. The Epic 1 currently stands as the brand’s biggest offering at 19.5 inches high, 23.53 inches deep and 32 inches wide. It comes with an interior that’s 14.13 high, 17 inches deep and 25 inches wide, and it weighs 50 pounds. The Epic 60, weighing in at 39 pounds, measures 17 inches high, 18.73 inches deep and 32 inches wide on the outside and 11.5 inches high, 12.36 inches deep and 24.86 inches wide on the inside. There’s also the 28-pound Epic 35, which measures 17 inches high, 18.73 inches deep and 22.5 inches wide on the outside and 11.5 inches high, 12.36 inches deep and 15.5 inches wide on the inside. Picking the right color may not be a priority when choosing which cooler to get, but you’ll be happy to know that some of ICEHOLE’s offerings will have several variations in case you want to be different from everyone else at whatever event you’re going to. The Epic 1 and 60 are glacier white and coyote tan, as most of the brand’s ice chests are, but the 35 is also available in yellow, burnt orange, maroon and more. Definitely plenty of choices here! It’s easy to side with more popular names when it comes buying products, and that can be the same case with coolers if you don’t do your research before going to the store. Yeti is most likely the first name that comes to mind when you think of well-known brands, but that shouldn’t keep you from taking advantage of everything ICEHOLE has to offer, as the differences listed below show. Most people are used to seeing coolers shaped as rectangles with the idea being that it is big enough to store a large amount of items. That’s the case with Yeti’s Roadies and Tundras, as its largest options measure up to 19,000 cubic inches and can hold as much as 82.4 gallons. That is A LOT! However, that is reserved more for big game hunting, while ICEHOLE’s Epics serve for multiple uses in their own rights. They’re big enough to store more than your average ice chest but designed compact enough to store the right amount and avoid long, difficult trips carrying them from the car. This makes them the perfect size for both a party at your friend’s house and a campout with a group on the weekend. Yeti has ice chests at a similar size, but its offerings are of a wider range that requires more thought beforehand about what you have planned for later, while ICEHOLE keeps it simple but available for somewhat of a large range. Both ICEHOLE and Yeti do a good job at keeping bears from getting into your cooler, but the assistance of the military with the former’s construction makes ICEHOLE more qualified to deal with the worst of conditions, whether they be wild animals or the heaviest rain and wind. TIP: For more bear-proof coolers, check this post. 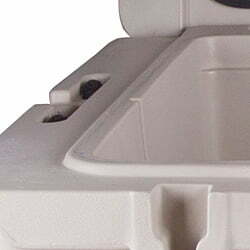 The ability to keep control of air pressure of items inside nice and cold was taken into account for both ICEHOLE and Yeti, as both have two inches of insulation to provide top-notch ice retention as seen in the best-insulated ie chests. Pressure-injected commercial-grade polyurethane foam is included in both brands to add extra insurance that the ice doesn’t melt. While picking the right color for your cooler shouldn’t be a major priority, if you’re looking for an ice chest that isn’t silver or blue like most of them, you’re better off sticking with ICEHOLE. Yeti’s offerings are currently available online (mostly) in white, desert tan and ice blue, but ICEHOLE edges out slightly with maroon, coyote tan, yellow, burnt orange and few more which are not the first colors you think of when you plan on buying a cooler, thus helping you stand out a bit from everyone else at the party. 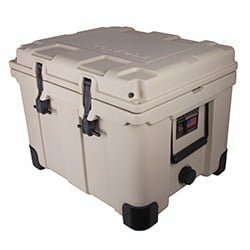 For those who are looking for more American-made products, you’ll be leaning much closer to getting a cooler from ICEHOLE as it’s 100% made in the US. Yeti, on the other hand, has some of their products made in the US but then they also manufacture a lot of their products overseas. Of course, that doesn’t impact the quality of all as Yetis are EXTREMELY well built, but in case you’re really looking to support the American economy, you’ll be happy to know that ICEHOLE donates a portion of its sales to non-profit organizations that help out our veterans, as well as their families. 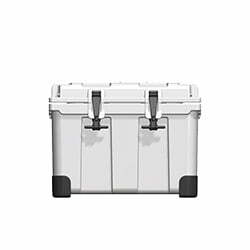 While Yeti has a list of coolers that have proven the quality of its brand name with their performance, ICEHOLE has all what it takes to rival its opponent. 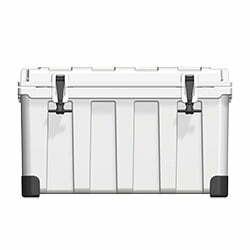 If you have the money to spend on Yeti’s larger options and having something coming up that requires such an ice chest, give it a whirl, but if you’re looking for a brand that provides high performance along with the opportunity to not hurt your wallet (although prices seem quite comparable), you won’t be dissapointed with the ICEHOLE – in fact, quite the opposite, it’s a fantastic ice chest. ICEHOLE makes sure to have accessories available, and despite costing extra, they’re worth it to provide high performance. 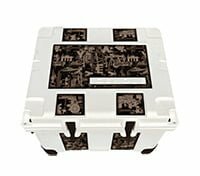 Each of ICEHOLE’s offerings comes with a high-tech wrap to add extra comfort and safety to the outside of the ice chests, in case you weren’t convinced after reading everything before this section. 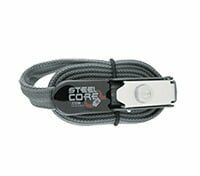 Several items are available to provide additional security so that everything inside stays there, including the Steelcore Security Wrap, ICEHOLE padlock and Strap Kit Epic, the last of which can be used for the Epic 35 and 60. 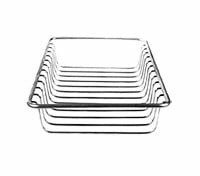 If you want to make sure that none of your items get mixed up and the stuff for the kids stays away from the stuff that’s for adults, ICEHOLE provides several options for baskets and dividers. In addition to holding certain amounts of items and arranging them so that everything fits inside, the beer won’t be mixed up with the kids’ snacks. You’ll be equipped with a variety of spare parts meant to keep items nice and tight, including rope, rods, latches and handles, in case you’re carrying an amount of food and drinks that make you worried about things falling out. As with almost everything you’re looking to buy, it’s becoming more and more common to buy things online, and that goes for products as big as coolers, as well. ICEHOLE is making all of its offerings available on its website. However, if you’re more used to big-name online retailers, then you’re in luck because these coolers have recently been spotted on Amazon. The prices looked the same for both websites at the time this article was being published. You’ll also be happy to know that all of the color variations are available at both spots, as are the accessories. 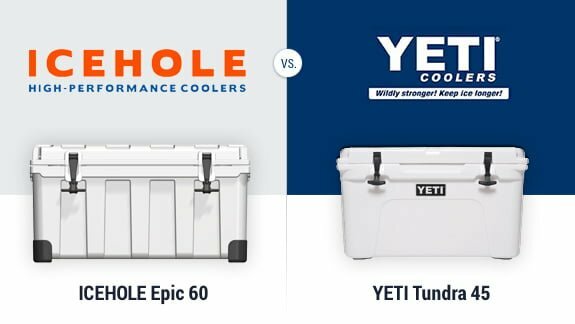 When it comes to finding a brand that offers coolers that can withstand the worst of scenarios at a reasonable price, ICEHOLE does an excellent job fitting the bill. 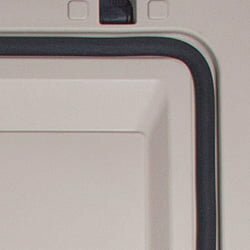 You’ll have a fair amount of accessories available to ensure security and the availability of cold drinks, and the size and color options more than many other brands. The design and focus on supporting our troops will also ensure that you’re backing American-made products. These factors ensure a quality cooler for your next outdoor vacation. We hope this ICEHOLE cooler review has been a help for you. Feel free to share your thoughts in the comments section below.